You may want to save money each time you shop online, but Start Savin is not one of those programs that can help. It is an adware application, and adware programs are pieces of software that automatically renders commercial advertisements. Start Savin is no different – it displays commercial pop-up ads under the pretence that it provides you with coupons and discount offers for a number of online shopping websites. Unfortunately, it may result in several security issues, so it would be for the best to remove Start Savin from your computer right now. Here it is important to note that Start Savin is not a malicious computer infection. You may not know how it entered your computer exactly, but it does not employ any kind of surreptitious tactics to infiltrate your system. The problem is that Start Savin is mostly distributed bundled with freeware, because the main homepage for the application at startsavin.com does not contain a healthy download link. In other words – you most probably download Start Savin onto your computer willingly, but users seldom are aware of that, because they think they install only one freeware application. However, the truth is that when you make use of third party file hosting pages and/or installers, chances are that you will get a new (and unnecessary) application on your PC. 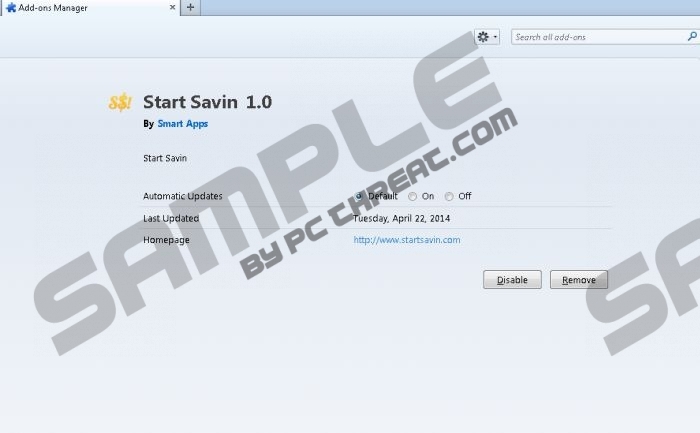 Start Savin is published by Smart Apps, and it can be installed as an extension on Google Chrome, Mozilla Firefox and Internet Explorer web browsers. It collects data on your web browsing history, processes it, and then displays various pop-ups, coupons, discount offers and what not, each time you access a supported online shopping website. The ads are usually branded as “This ad brought by Start Savin” or “Ads by Start Savin”. Such behavior can be extremely annoying especially when Start Savin slows down your browser and interferes with your web surfing. What is more, apart from being annoying, Start Savin might also unintentionally redirect you to suspicious and even dangerous websites that are part of various marketing schemes and even malware distribution network. Thus, you are strongly discouraged to click the Start Savin pop-ups, because you can never know whether the content you are about to be redirected to is safe or not. To prevent any potential system and financial harm, you should remove Start Savin immediately. Do not forget that Start Savin does not enter your system on its own. You are bound to have other potentially unwanted applications installed on your PC. To determine them and to get rid of them, scan your system with SpyHunter free scanner and then acquire a reliable antispyware application. Open Uninstall a program and remove Start Savin. Go to Uninstall a program and remove Start Savin. Go to Control Panel and open Add or remove programs. Quick & tested solution for Start Savin removal.